Anna Schmidt finally has some good fortune coming her way, for what might be the first time in months (or years? ): her passport issues have finally been resolved with the Russian authorities, as she’s kindly escorted by Sergeant Paine onto a train presumably bound for her native Czechoslovakia. But at what price comes her freedom? For now, Anna assumes that Major Calloway has struck a deal with his Russian counterparts, though she’s flummoxed as to why he would suddenly take her side; Paine offers the unconvincing explanation that the Major has a soft spot for Anna, a claim belied by Calloway’s brusque treatment of her throughout the film. What the audience has just discovered (not to mention what Anna will soon learn, and what Jeremy recounted on Tuesday) is that Holly Martins has proposed a disturbing trade: Anna’s safety for Harry Lime’s apprehension, facilitated by Holly’s betrayal of his longtime friend. Those who have already seen The Third Man, though, know that this is not how the film concludes: director Carol Reed and producer David O. Selznick won out in their preference for a bleak ending that would retain the film’s moral ambiguity and solemn worldview. With the melancholy final moments of the film now permanently imprinted in my memory, I can’t even imagine how the film would be changed if it ended with Greene’s intended note of uplift. Indeed, it almost seems like Holly’s moral transformation requires an unhappy ending: if his character arc essentially shifts from idealism to a dead-eyed cynicism assailed by the cruelties of the world, he must ultimately sacrifice his own happiness to arrive at such a desolate conclusion. It would be easy enough for Holly to hightail it out of Vienna, a city that has offered him nothing but doubt, loneliness, hopelessness, and angst; instead, he does everything he can for the woman he loves, although he may already be quite aware that Anna will never forgive him for his betrayal of Harry. Betrayal is, of course, a predominant theme throughout much Western literature, but surprisingly there’s little consensus as to what the term actually means, psychologically and philosophically. The accepted psychological definition terms betrayal as a breach of social contract, though this terminology has been criticized for failing to incorporate the actual motivations, conditions, and effects of betrayal. Interestingly, artificial-intelligence researcher Selmer Bringsjord programmed the concept of betrayal into the core of a storytelling program tellingly named BRUTUS; in that case, betrayal was defined in the language of computer programming as “knowingly thwarting another out of something that ought to occur,” though this assumes that the betrayed necessarily has a right to that which they’re deprived of through betrayal. In The Third Man, Harry hardly seems entitled to the freedom and monetary wealth that his life of corruption, greed, and alienation have so far enabled for him; does this mean that Holly in fact doesn’t betray Harry, since Harry’s freedom and well-being is something that “ought not occur” in the first place? The question may be unanswerable, especially to Holly, who no doubt will feel the guilt from this quasi-ethical decision throughout the rest of his life. There are, of course, numerous examples of betrayal in the arts, but the most pertinent (and, perhaps, totemic) example might be Richard Wagner’s opera Götterdämmerung (Twilight of the Gods), the last in Wagner’s four-opera cycle Der Ring des Nibelungen. There are actually numerous treacheries and betrayals that catalyze the opera’s plot, but the most nefarious character is unquestionably Hagen, the chief minister to the Lord of the Gibichungs, who sets in motion a plot to poison Siegfried and force him to betray his beloved, Brünnhilde. Hagen’s underlying scheme is to steal the all-powerful Ring of the Nibelungens that belongs to Siegfried; he does so by spearing Siegfried in the back (after a spurned Brünnhilde informs him that Siegfried is vulnerable there) and ultimately killing the king (and his half-brother) Gunther when he objects to Hagen’s duplicitous plan. Aside from being Hitler’s favorite opera, the inspiration for the title to Friedrich Nietzsche’s 1888 book Götzen-Dämmerung (loosely translated: Twilight of the Idols/False Gods), and the etymology of the English usage of the term as a catastrophic endpoint, the Götterdämmerung presents betrayal of one man by another as a soul-shattering injustice that sets in motion an apocalyptic cycle of retribution and self-destruction. (Hence the burning of Valhalla at the climax of the opera: even the gods are consumed by flames.) Especially interesting are Hagen’s self-justifying words after he slays Siegfried: “Perjury avenges itself!,” referring to Siegfried’s supposed disloyalty to Brünnhilde (though that was itself a result of Hagen’s evil plot) and Hagen’s belief that Siegfried’s own betrayals sentenced him to a just execution. Obviously, then, Hagen’s words can only be seen as disingenuous, but would Holly claim the same of his “betrayal” of Harry: that “perjury avenges itself,” that Harry’s ultimate capture (or even his demise) are simply penance for his crimes against humanity? 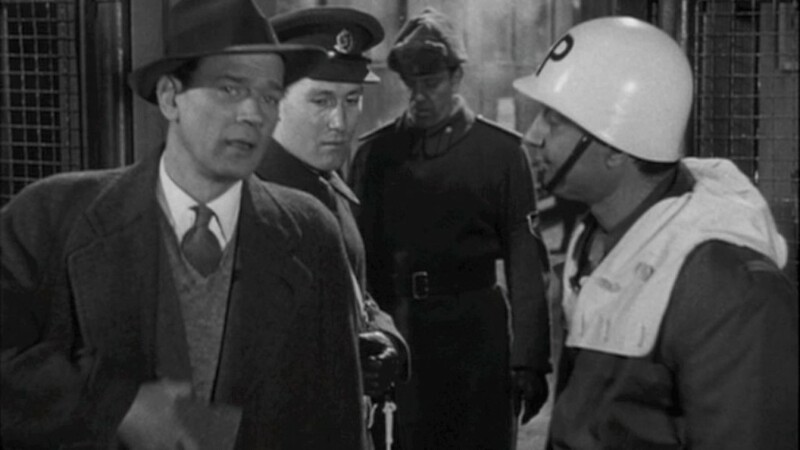 Either way, though The Third Man ends somewhat quietly and sadly, it still seems appropriate to apply the term götterdämmerung to it: a disastrous conclusion of events, an inevitable misery that Holly may have wittingly already set in motion. 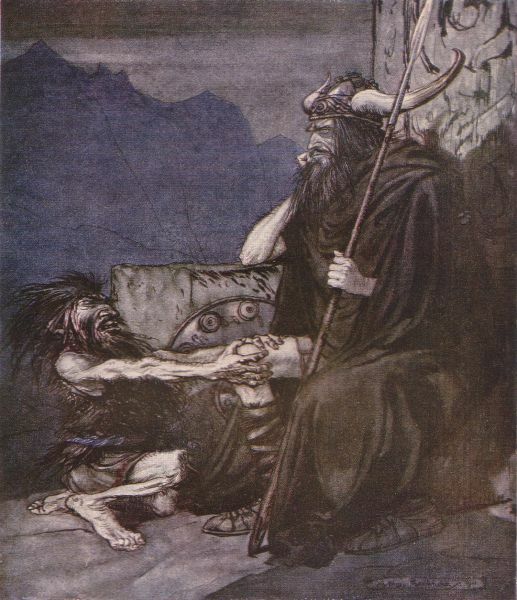 Hagen’s father Alberich appears to him in a waking dream and proposes an evil scheme for obtaining the Ring of the Nibelungen, in Arthur Rackham’s 1912 painting ‘Alberich Speaking to Hagen,’ an interpretation of Wagner’s opera. To return to the world of The Third Man: as a somber Holly observes Anna boarding the train from a distance, aware that his presence there would clue her in to the covert deal he’s made with Calloway, the setting of the scene in a Viennese train station subsumed by steam and the lonely roar of trains chugging to life lends the moment tremendous drama and sadness. If we mentally rewind to the beginning of the film, we may recall that, after the sardonic opening voiceover provided by Carol Reed himself, the first scene of the story proper also takes place in a train station as Holly first arrives in the city. Compare Holly’s carefree exuberance in that scene with the bitterness that now pervades his every gesture; Holly has undergone a bleak epiphany, as he bears witness to the disheartening ways in which the world actually operates. A flashback to Still Dots #5, as Holly first arrives at Vienna’s train station. Image © Studio Canal. Holly waits for Anna to board her train, observing her from afar. Image © Studio Canal. Trains and train stations have a long and intimate relationship with cinema: in fact, if we think about one of the Lumière Brothers’ first films, Arrival of a Train at La Ciotat (1896) – the film that, according to oft-repeated (and perhaps exaggerated) accounts, sent audience members scrambling under their seats in a panic – we may realize that compositional depth in cinema was practically inaugurated by the movement of a train from the background to the foreground. In the early twentieth century, the moving vistas provided by train windows were seen as analogous to new forms of cinematic vision: both provided “screens,” or barriers between one world and the next, that allowed immobile spectators to observe life passing before their eyes. 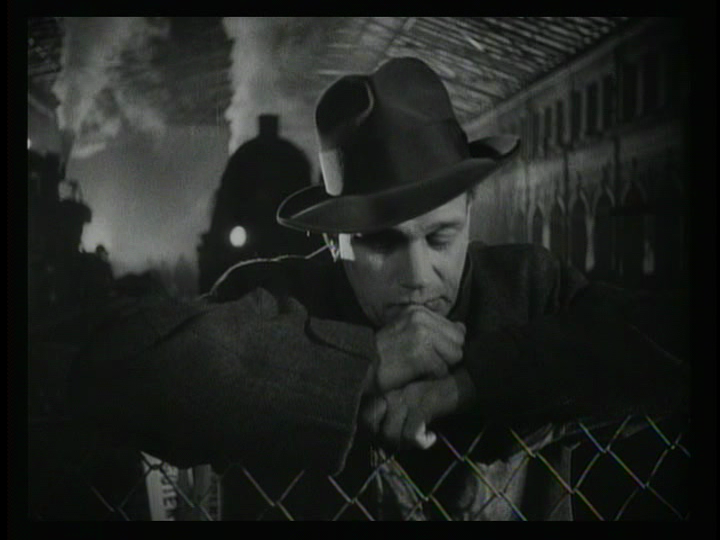 To flash-forward to one of The Third Man‘s contemporaneous films, a train station provided a significant and melancholy setting to David Lean’s 1945 drama Brief Encounter. 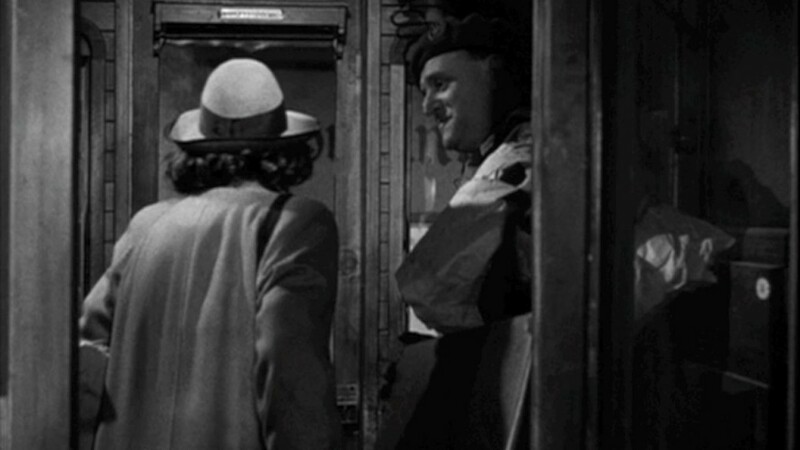 In that film, a suburban housewife (played by Celia Johnson) trapped in an affectionate but loveless marriage takes the train every week to the city to shop and visit the cinema; while waiting to board the train home one week, she meets an idealistic doctor (played by our own Major Calloway, Trevor Howard), also married with two children. They strike up a friendship that quickly (and against their will) transforms into love, yet when their initial attempt to spend an illicit afternoon together fails to transpire, they vow to part ways and never see each other again. But of course they do, in the milieu that originally thrust them together: the dining car of a train. They hope to reconnect, to be somehow thrown together, or at least have a proper farewell – but an acquaintance interrupts their tumultuous reunion, the doctor’s express train arrives, and the housewife (after contemplating throwing herself upon the tracks before an oncoming train) returns home to her family. Life for these two characters chugs along relentlessly, their paths interchanging briefly only to depart from the station again: quietly existential, Brief Encounter envisions life itself as a railway journey. Still Dots 82 similarly suggests that Holly’s time in Vienna, morally transformative and emotionally devastating though it is, is little more than a brief stopover: his train arrived, Anna’s will depart, their tracks will proceed in opposite directions. Yet for Holly, Anna, and Harry (not to mention for Celia Johnson and Trevor Howard in Brief Encounter, or for Russell and Glen in Weekend , Andrew Haigh’s modern reincarnation of Brief Encounter) an entire figurative life plays out before the train leaves the station. 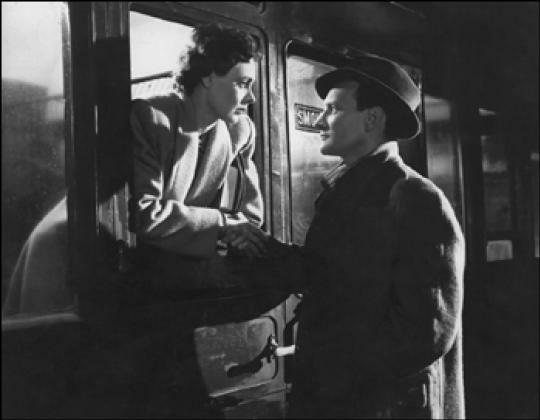 Trevor Howard and Celia Johnson find love through the window of a train in ‘Brief Encounter’ (1945). Image © The Criterion Collection. Russell and Glen part ways at an Amtrak station in ‘Weekend’ (2011). Image © Sundance Selects.